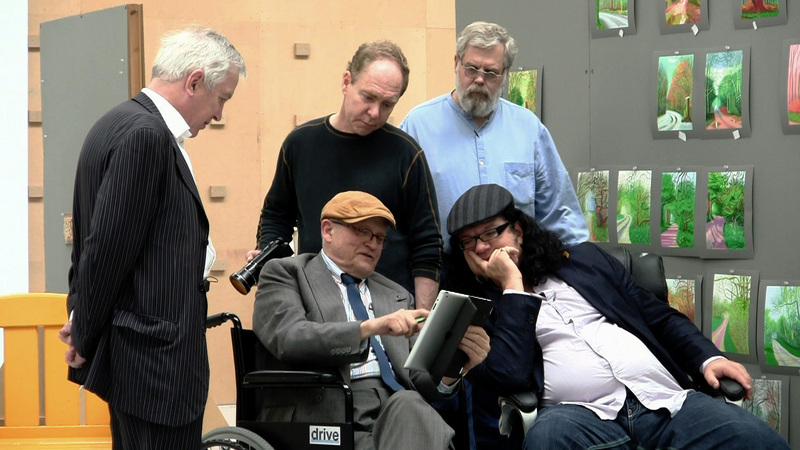 The filmmakers of TIM’S VERMEER gather with Professor Philip Steadman and artist David Hockney in Hockney’s studio in England..Standing, left to right: Professor Philip Steadman, Director Teller, and Tim Jenison. Seated, left to right: artist David Hockney, Producer Penn Jillette. ©High Deft Pictures. CR: Farley Ziegler. 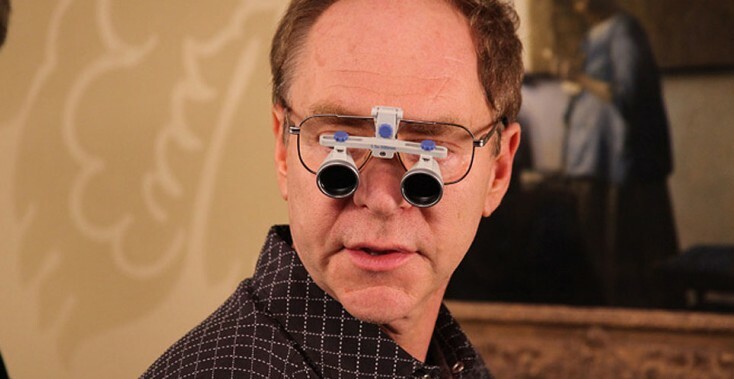 HOLLYWOOD—Teller is internationally known as the quiet half of the Penn & Teller magic act. But the veteran entertainer has a lot to say about “Tim’s Vermeer,” a documentary he co-produced and directed, about a charismatic and tenacious Texas inventor who may have solved one of the greatest art mysteries of all time: how 17th century Dutch artist Johannes Vermeer painted so realistically. The founder of NewTek, a hardware and software company that produces visual imaging software for computers, Tim Jenison used his LightWave modeling and animation system to aid him in building an exact replica of Vermeer’s “The Music Lesson” set in order to test a theory that the Dutch master used mirrors and a modified camera obscura device to create the realistic light in his paintings. Teller, and his stage partner Penn Jillette (who serves as the narrator and on-camera interviewer), knew they wanted to make a film with their inventor friend, but they didn’t know their story would ultimately focus on Jenison’s determination to paint an exact duplicate—or as close to exact as possible—of Vermeer’s painting. During the long filming process—it took months for Jenison to recreate the painting after spending a year building the set in a San Antonio warehouse—Penn and Teller managed to convince renowned artist David Hockney, who wrote about the technique and the camera obscura theory in his book “Secret Knowledge” as well as architect/author Philip Steadman, who wrote about the camera obscura painting theory in his 2001 book “Vermeer’s Camera: Uncovering the Truth Behind the Masterpieces” to be part of the film. The Philadelphia-born Teller chatted about making his first feature-length documentary and how an idea for a skit for the “Penn & Teller Bull****!” series evolved into an educational and entertaining documentary. Q: How long did you work on this? Teller: I was involved with it for five years. Four years of shooting and a year of editing. It’s hard because human experience doesn’t have any story to it. This is part of your day and that is part of your day. This may be something you’re interested in. So it’s coming from many different directions. We have four years of that where we had to say, “How do we give this the same quality that ‘Raiders of the Lost Ark’ has? How do we give it a sense of purpose and coherence?” because that’s what movies are about. If we were writing a book on this, which Tim may eventually do, it won’t be like the movie. But when you’re sitting in a theater, you need to be carried forward on a wave of something. Tim Jenison (right) demonstrates his first painting experiment to his friend, producer Penn Jillette (right), in TIM’S VERMEER. ©High Deft Pictures. CR: Carlo Villareal. Q: It’s a credit to you as the filmmaker that you’ve accomplished this. Teller: You can credit it to me but don’t shortchange all the other people who are critical here, particularly the editor, Patrick Sheffield. He’s the man who should be awarded a Congressional Medal of Honor for this movie. We hired him right when we began shooting and, by the end of the shooting, we had boiled it down to a nice, concise 2,400 hours of footage. Q: So you actually had more footage? Teller: Oh yes. I think this probably will be the best DVD eventually. There were stories we couldn’t tell without interrupting the flow of story that are thrilling. Q: It must be great for you to see the material you couldn’t use in the feature get a second life on DVD, right? Teller: There was one point where we were sort of feeling our way into the material where we made a discovery. We originally thought the adventure was about Vermeer. That’s where we started. We didn’t realize it was about Tim, for the longest time. We thought maybe we should present this as a “Penn & Teller Bull****!” episode. We would do a bit and then Tim would show us how the point applied to the painting. So we would do a bit about mirrors being used in magic tricks, and then Tim would show us the application for that, and we thought there might be a structure to it. There’s some of those pieces that I’m sure will be on the DVD. At one point, Penn said, “It seems like Tim is solving an old mystery” and we happened to be doing some shows in London. So we thought, “Why don’t do something on Jack the Ripper as an unsolved mystery?” So we went to the alleyways where Jack the Ripper killed people and we hired a British actress to play a ripped whore, lying on the cobblestones in period costume, with blood flowing out of her throat, and Penn did this monologue about old, unsolved mysteries and how Tim was like this detective. I’m sure that will be on the DVD as well. As we were finding our way to telling this simple story, we ran into alleys like that. For example, Penn got an idea of setting this whole thing up like a videogame, so you’d see pictures of the picture getting more and more complete, and on the side you’d have a column that would indicate Tim’s life force dwindling as he got exhausted. It was a clever idea, but clever with a capital “C.” What you really care about is Tim; you don’t need all the distraction on the screen. Q: What do think this story is about? Teller: In specific terms, what we finally realized was the best spine to hang all of these ideas on was the act of Tim longing to paint his Vermeer, and painting it. Everything else could branch out from that. That was a big breakthrough for us. I remember almost exactly what the breakthrough moment was. It was a piece of an interview that we hadn’t really paid attention to right about the time Tim came back from Britain and he’d seen the queen’s painting, and he’d come home so discouraged. At that point, I caught him in his warehouse, and I said, “Let’s talk about the situation Tim, are you going to succeed?” And, looking very pale, he sort of went, “Oh, you know, at night, when I’m trying to get to sleep, all I can think about is this goal of painting a Vermeer. If I can do it, it will be remarkable because I’m not an artist.” Those are the opening words of the movie. Once we had that, we knew we had the concept. So now, we had that simple spine, and all technical stuff you’ve got to know was all in the service of understanding how Tim got to paint his painting. Tim Jenison makes his first painting using his invention the “comparator mirror” and a photograph of his father-in-law in TIM’S VERMEER. ©High Deft Pictures. CR: Luren Jenison. Q: Did he keep the set? Teller: It’s absolutely intact. If you go to San Antonio, Texas, and visit him, he will take you over to his warehouse and show you that set completely intact. There was so much to it. Fortunately, he’s a techie. He wouldn’t have been able to do it unless he was Tim Jenison, a guy whose company produces LightWave, because the first thing he did was take the Vermeer painting and modeled all the information in LightWave so that he could figure out the dimensions of things, the placement of things, the size of the room, the size of the windows, the number of windows, all that stuff—he had to figure out on LightWave. And, being a techie, when he’s in the museum in Delft, with his Canon camera photographing the lion’s head finials on those chairs from every angle so that he could go back and program it into his electronic carving machine and reproduce it in his shop. So every bit of it was a whole little adventure. Teller: The very first thing we completed on the movie was the sequence of Tim building the room. Our editor originally did it as a music video. He used the Propellerheads’ song “History Repeating.” That whole sequence remains pretty much intact as he first edited it, but once we dropped it into the movie with that gorgeous Conrad Pope score, we could no longer use “History Repeating” in the same way. Conrad came up with a sort of Aaron Copland-like hoedown. It maintains the same spirit but in the vocabulary of the movie’s sound. Q: Penn said he pushed for the Bob Dylan’s “When I Paint My Masterpiece” at the end. Teller: We went back and forth on that. While the Propellerheads was still in there, the Dylan song didn’t work at the end. When the Dylan song was the only piece of popular music, it was fabulous. The idea is if you have a Dylan piece, you don’t want it to seem like just another song. You want it to be the statement. Q: How did you juggle making this film while doing your Las Vegas show? Teller: A combination of ways. The stuff in Delft was the first stuff we shot of the movie. I had a lecture I had to do in Amsterdam, and Tim was going to be in Europe. I said, “Well, I’m there, so let’s get a couple of days in Delft and grab some footage.” We shot a bunch of stuff there very fast. We really just looked around said, “What do we want to do next?” So that was one way. I had a break from (the show at) the Rio and I was doing something that got me near the area. The other thing is we always get Thursdays and Fridays off, so I could fly out on Thursday or Friday to San Antonio, as needed. The stuff in London where we visit (artist) David Hockney, Penn and I were performing there. We’d finally gotten through to him after at least a year of knocking on his door. We said to him, “Would you like to come to London and see the picture?” and he said, “I don’t like being in crowds. My hearing is not good and it makes me very uncomfortable, but if you guys want to come out to my studio in Ridlington, we could do that.” And we went, “Okaay!” We told him we’d bring these RED cameras along and it’ll be wonderful, and suddenly he became very quiet, because he had had some unpleasant experience with documentarians. And besides, we’re Penn & Teller, so who knows, we might be trying to put him on. So we slipped a couple of HD cameras into our handbags and went out to visit him. He was immensely gracious. He showed us around his studio, took us to his house and laid out a gorgeous lunch on the dining table that he’d been fed by his mother on. He and Tim sat together and were immediately brothers. They talked the same language and Tim was so steeped in the stuff. Then the end of lunch came and David said, “So, are you going to show me this invention?” And Tim said, “Sure. Where would you like to do it?” And he said, “How about my studio on the top floor?” At that point, I said to David, “We happen to have some video recorders. Would you mind terribly?” And he said, “Of course not!” By that time, he knew he wasn’t being had. Q: Did you try using Tim’s device yourself? Teller: Oh yeah. I sat at Tim’s table just trying the father-in-law picture (that he draws as his first experiment with the device). It’s fascinating. It’s like some weird form of meditation where your brain shuts down and you just become this mechanical thing that’s trying to match the color as you move your head back and forth. You drift off and time vanishes, and the results are amazing. Q: Has this inspired you to do more feature directing? Teller: We’ll see. I do a lot of theater directing. I’m about to do “The Tempest” with music from the repertoire of Tom Waits and Kathleen Brennan. We’re replacing the Shakespeare songs. So, yes, I may do more film. I go project by project. Offer me a feature film, and I’ll certainly look at it. Or maybe I’ll write it. Q: Was the five-year commitment to this film worth it? Teller: Oh yes. This is one of the most satisfying things I’ve ever done in my life.